Cobra Hydro Ltd is a specialist with anti odour activated carbon filters, that are used in various kinds of sewage system odours, including inspection chambers, sewage pumping stations, septic tanks and molecule chambers. The main function of anti odour carbon filters is reducing odours escaping from sewage systems. 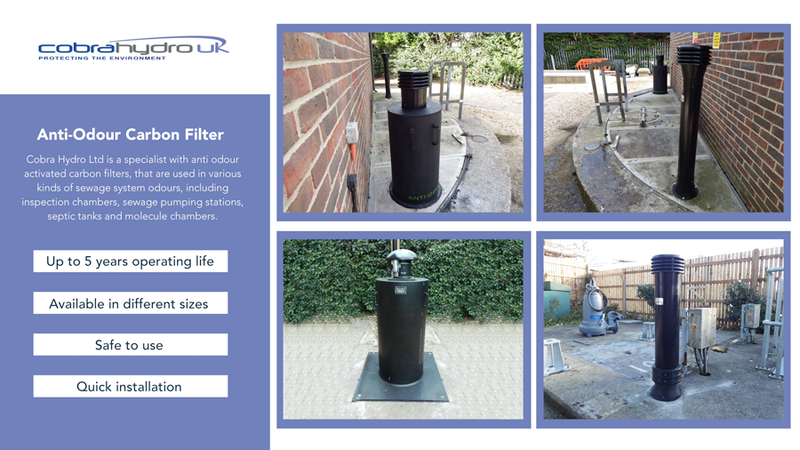 Anti odour carbon filters neutralise the sewage system odours immediately. We supply a full range of filters. The carbon media is converted by thermal decomposition in a furnace using controlled atmosphere and heat. The resultant product has an incredibly large surface area per unit volume, and a network of submicroscopic pores where absorption takes place.